Dark Woods (2006) is a low budget, independent movie filmed and released back in 2006. The movie was directed by Jake Daniels and is one of only two credits attributed to his name. The general quality of low budget filmmaking does not get much lower than that on display in this film during its relatively short 75 minute runtime. I can't say with any certainty how much money was spent on the production of this film but I would hazard a guess that the number does not exceed $10,000 and is likely much, much less. Now I know that a leading paragraph like that doesn't do much to paint Dark Woods in a positive light, but let me confess that I don't mean for it to sound negative. I just want to be upfront about the kind of movie we're talking about. This is not a Hollywood picture by any definition of the phrase and your expectations should be adjusted accordingly. As easy as it might be to trash the technical components of this movie and call it a day, I must confess that I still enjoyed watching Dark Woods. The film ignited a strong feelings of nostalgia within me, particularly reminding me of low budget 80's slashers from my childhood. This brings us to the movie's strongest point; the people in charge of making this film were clearly very passionate about the genre. There are so many tips of the hat towards a variety of popular 1980's horror franchises that the nods almost cease to be subtle. The cook, for instance, is an older blonde woman by the name of Pamela, which I took to be a reference to Friday the 13th's Mrs. Voorhees. Even the physical similarity between the actress and Betsy Palmer is rather striking. Along the same lines, the last girl is a young, fresh-faced brunette by the name of Heather, referring to Heather Lagenkamp, the actress that played Nancy in A Nightmare on Elm Street. The homages present in Dark Woods does not end with the names of its characters. The plot of the film revolves around a group of teenage camp counselors whom have come together to finish preparing Camp Vernon for the upcoming season. The teens succumb to the usual stock of horror-cliche, young people vices and are picked off one by one by a machete-wielding, hockey mask-wearing backwoods maniac named Victor. It would be easy to interpret the plot of the film as entering into Friday the 13th rip-off territory; the filmmakers even include a soothsayer character along the lines of Crazy Ralph, here creatively dubbedMad Max, to inform the kids of their impending doom. So there I was, about twenty minutes into the film, just about ready to write the film off entirely when the filmmakers did something that surprised me. Instead of merely copying Friday the 13th, but the filmmakers began to take some of those basic elements and expanded on them in new and interesting ways. It should come as no surprise given her name and physical similarities that Pamela actually has ties with the masked murderer, Victor. There is a bit of a shift in the relationship however, as Pamela was once Victor's lover and, thankfully, not his mother. Although it never become perfectly clear, it seems that Victor's murderous rampage is somehow motivated by his desire to win back Pamela's good graces. This relationship represents a deviation from the formula, certainly, but in the end is really rather uninspired. The interesting expansion of ideas that I had previously mentioned can largely be embodied in the soothsayer character, Mad Max. Much like Crazy Ralph, Max turns up early in the movie and warns the teenagers of their impending doom and serves the function of a red herring. Unlike Crazy Ralph whom promptly disappears from the rest of the proceedings, Max becomes a recurring character. 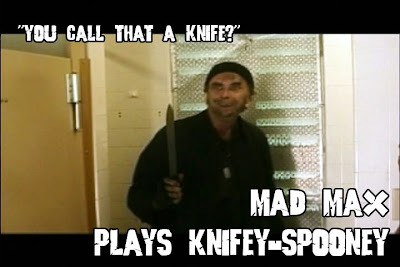 As the movie unfolds it becomes increasingly obvious that Mad Max is not only eccentric, he's actually quite twisted. Before long it is revealed that Mad Max is actually helping Victor by spying on the counselors and reporting back to him on their whereabouts and activities. Turns out, Mad Max is an old Vietnam War buddy of Victor's and goes so far as to carry out some killings himself. Admittedly there's nothing earth-shattering about this scripting but the fact remains that this is not a character relationship that I've seen in a movie of this genre before. The filmmakers deserve credit for creativity. Based on the picture and sound quality, I'm guessing that Dark Woods was filmed on a VHS camcorder with only a single microphone. I'm not sure that there was any real lighting to speak of on the set. 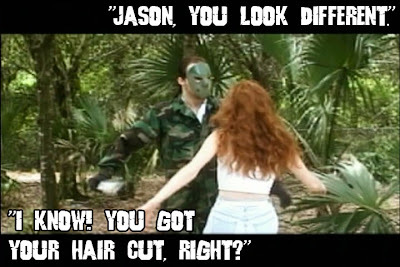 Almost all of the kills happen off-screen with only a quick cut back to the dead body showing the actors sporting what is clearly a cheap make-up shop latex appliance. Tom Savini this is not. On the other side of the quality spectrum, all of the actors performed quite admirably for a group of complete amateurs. With the only exceptions being limited to single scenes, they all manage to avoid fulfilling the overacting, annoying stereotype that commonly graces such low budget fare. Kudos to you all. The Bottomline: Dark Woods is the definition of low budget filmmaking. Due to the technical limitations, I cannot recommend this film to people who only casually dip into the direct-to-video movie market scene. That does not mean that there isn't anything here to like. If you are a devoted fan of Grade-Z cinema, then this one is definitely worth a look. It is currently available to rent on Netflix. 1 Bruce.